International Journal of Research in Health Sciences,2014,2,4,1046-1049. 1M.Sc. Public Health, Centre for Social Medicine, PIMS (D.U.) Loni, INDIA. 2Associate Professor, Department of Community Medicine, Rural Medical College, Loni, INDIA. Background: Wealth may affect the health of the children through different channels. Health status of under-five children is affected by the wealth index of the family. These problems mainly severe in the developing countries. Materials and Methods: The cross sectional study was carried out in Rahata taluka among the 200 household by using systematic random sampling. The respondents were interviewed face to face with the help of household questionnaire (NFHS-3) for wealth index and its association with morbidity pattern among under- five children. Result: In this study, the wealth index was constructed by giving the scores to each household asset. Out of 200 children 70 % were found ill in last six months. The majority of the children belonging to lower class had one or other illness during the last six months (96.30%); amongst them the majority of the children were ill because of ARI and Diarrhea. The chi-square test showed a significant association between wealth index and morbidity in under-five children (p <0.001) with the majority of children belonging to lower quintile. Conclusion: The study concludes that there was an association between the wealth and health, because those who had a higher wealth index were having less morbidity as compared to those who belong to the lower wealth index. 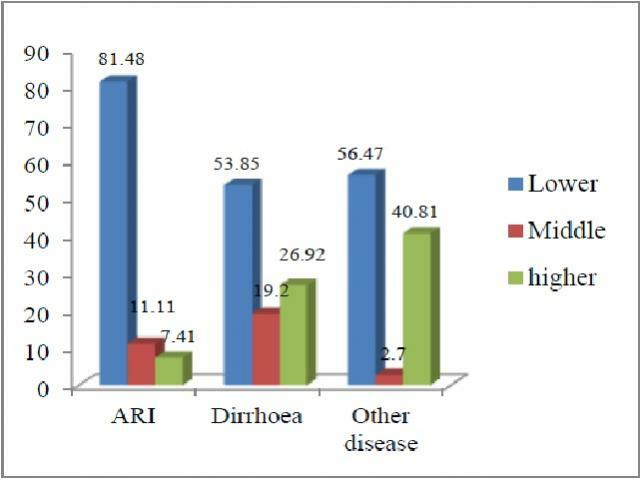 Diarrhoea and ARI were the main causes of illness in under- five children.